For Persepolis and Logicomix fans, a New Yorker cartoonist’s page-turning graphic biography of the fascinating Hannah Arendt, the most prominent philosopher of the twentieth century. One of the greatest philosophers of the twentieth century and a hero of political thought, the largely unsung and often misunderstood Hannah Arendt is best known for her landmark 1951 book on openness in political life,The Origins of Totalitarianism, which, with its powerful and timely lessons for today, has become newly relevant. She led an extraordinary life. This was a woman who endured Nazi persecution firsthand, survived harrowing "escapes" from country to country in Europe, and befriended such luminaries as Walter Benjamin and Mary McCarthy, in a world inhabited by everyone from Marc Chagall and Marlene Dietrich to Albert Einstein and Sigmund Freud. A woman who finally had to give up her unique genius for philosophy, and her love of a very compromised man--the philosopher and Nazi-sympathizer Martin Heidegger--for what she called "love of the world." 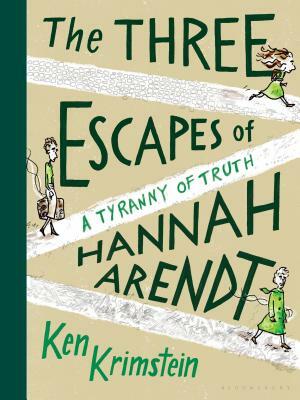 Compassionate and enlightening, playful and page-turning, New Yorker cartoonist Ken Krimstein's The Three Escapes of Hannah Arendt is a strikingly illustrated portrait of a complex, controversial, deeply flawed, and irrefutably courageous woman whose intelligence and "virulent truth telling" led her to breathtaking insights into the human condition, and whose experience continues to shine a light on how to live as an individual and a public citizen in troubled times. Ken Krimstein has published cartoons in the New Yorker, Punch, the Wall Street Journal, and more. He has written for New York Observer's "New Yorker's Diary" and has published pieces on websites including McSweeney's Internet Tendency, Yankee Pot Roast, and Mr. Beller's Neighborhood. He is the author of Kvetch as Kvetch Can, and teaches at De Paul University and the School of the Art Institute of Chicago. He lives in Evanston, Illinois.